That culture has taken on international accent nowadays, with Provo's 44 square miles by far the most developed in the T&C. Provo is home to about 18,000 people including one near human, Jo Jo, the national treasure that is an ultra-friendly dolphin. 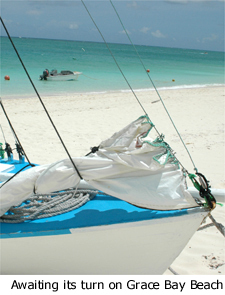 The main Provo attraction is a 12-mile beach, arguably one of the most beautiful in the world. The international airport is located in Provo so every tourist must land there on an island 18 miles long and 3.5 miles wide, with a central four- lane highway lined by a few little strip malls. The temptation is to simply stay in Provo, maybe play the world-class 18-hole golf course owned by the Emir of Quatar. The temptation may also simply be to do nothing but catch some rays (of the sun variety), dive, go fishing, enjoy the coral reefs off the Princess Alexandra National Park and let life be a beach and then you dine, as the saying goes. The legendary beachfront conch shack, Bugaloos, beckons, as do kayaking eco-tours in the Princess Alexander Nature Reserve at the eastern tip of the island. 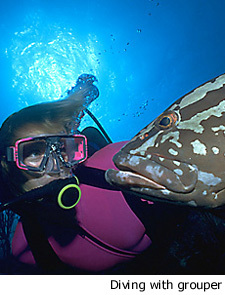 Sporting activities are centered around water: visitors can choose from deep-sea, reef or bone fishing, sailing excursions, windsurfing, water-skiing, parasailing, tandem skydiving, snorkeling, scuba diving, helmet diving and beachcombing. And there's world-class whale watching during the winter months when humpback whales holiday at the banks to the southeast of T&C in a mass migration from the frigid north Atlantic that has been going on for thousands of years. The best place to unwind may well be the Turtle Cove Marina where the beat of Caribbean music is often heard drifting over the boardwalk from the adjacent bars and restaurants. Among the island specialties are fresh lobster, jerk chicken, coconut rum cheesecake and conch fritters. One of the more offbeat attractions may well be the Caicos Conch Farm, billed as the world’s only conch farm. The conch is the national food of T&C, and it is endangered and threatened throughout most of the world. So this unique establishment gives hope for the future, offers guided tours, breeds these tasty Caribbean delectables for both local and overseas markets, and sells uncommon gifts crafted from and related to the conch. It is located at the eastern end of Leeward Highway. 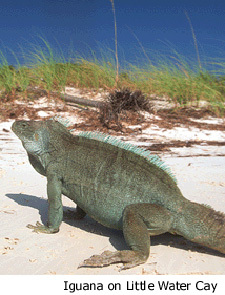 One of the most popular island attractions, the island of Little Water Cay, is a Nature Reserve and is home to the country's endemic iguanas. It is like entering a bit of the Galapagos, a time capsule from the days of the dinosaurs. And it is easily accessible from the Leeward Marina. Northwest Point may well be the most adventurous expedition, with a four-wheel drive vehicle recommended for the bumpy roads heading westward. Either walk the north shores beaches west of windswept Crystal Bay, or travel to the west on Malcolm Road for the beach. For a real adventure, walk all the way around the point, thrilling to exotic sea birds, crashing waves and isolation that makes you feel a world apart from civilization. 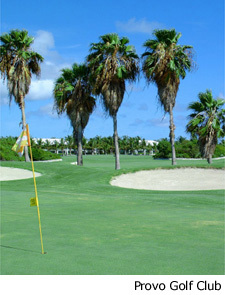 More adventure comes in the form of "The Hole" on Long Bay. This natural phenomenon is a giant sinkhole measuring 40 feet across and 80 feet deep. Once an underground cavern, the ceiling of this structure collapsed creating an impressive crater dropping 100's of feet into deep ground waters. The sheer drop makes for an awesome-sight. As do the frolicking Glow Worms. Each month, one of the most romantic displays takes place in the shallow waters of the Caicos Banks between the third and sixth day after the full moon. A natural phenomenon triggered by the light of the waning moon inspires small invertebrates known as "Glow Worms" to engage in their illuminating mating rituals, true points of light. As the female releases her eggs and the male fertilizes them, a brilliant luminescent green is emitted and works its way up to the surface of the water. It makes for a real turn on, a romantic counterpart to that elusive "Green Flash," the moment when the sun sets picturesquely over the horizon of blue sea and that iridescent "Green Flash" blinks at the horizon just before that lucky old sun sets on another day. So c'mon down to the T&C, where more than 200 birds have been recorded in the islands, including the Magnificent Frigatebird and Cuban Crow. And the living is easy for "snow birds" at any time of year. The official language is English and the currency used is the U.S. dollar. But it is hard to leave the T&C. Indeed, there are 25,000 reasons why you will not want to leave, along with 25,000 reasons why you will want to come back. Those 25,000 (and counting) reasons comprise the inhabitants of T&C, according to Micheal Misick, Chief Minister and Minister of Tourism, who says – rightly – that the "Belongers," are among the warmest and friendliest in the world. They make you feel at home, like you belong. And WIMCO vacation villas make you feel the same way.